This is a blog post about four topics that have nothing in common. You simply must look at these numbers on the DOE’s average home energy use. This site generated quite a bit of discussion between my husband and I. On average, 31.2% of household energy is used for heating and air conditioning, 9.1% is used for the water heater, and 26.7% is used for kitchen appliances. The refrigerator alone uses 13.7% of a home’s energy. Compare this to a mere 2% of energy consumed by PCs and printers (and this was before everyone had more efficient LCD monitors). If you really want to help the environment, turn off the AC and get a smaller fridge. 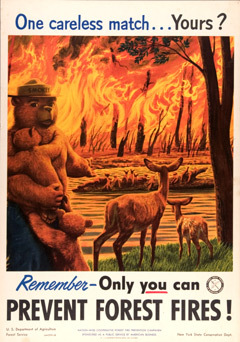 On second thought, maybe I’m not ready to be an environmentalist. 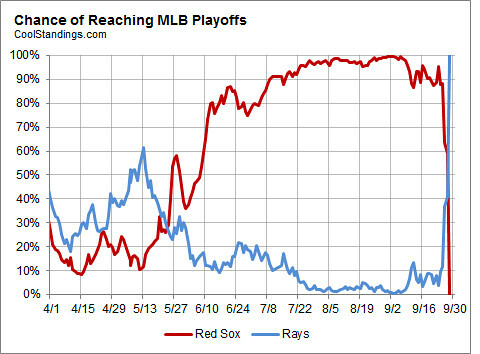 Nate Silver of the NYT calculates the odds that the Red Sox would not make the playoffs. On September 3, they held a 9 game lead over Tampa Bay, with a mere 0.004 chance of missing the playoffs. Ouch. As a Cubs fan, I found a little solace in the Red Sox collapse. It helps to reduce the pain associated with the many, many Cubs collapses over the years. 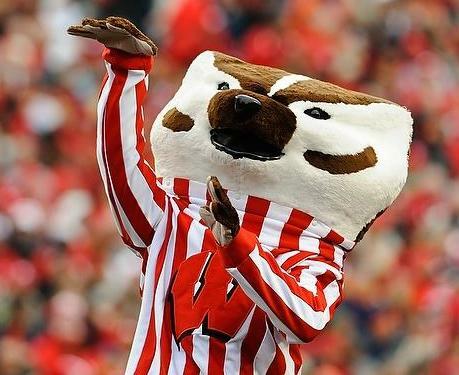 (Luckily, I’m also a White Sox fan). The 10 teams who ruined the greatest chance of making the playoffs is surprisingly not dominated by the Cubs. 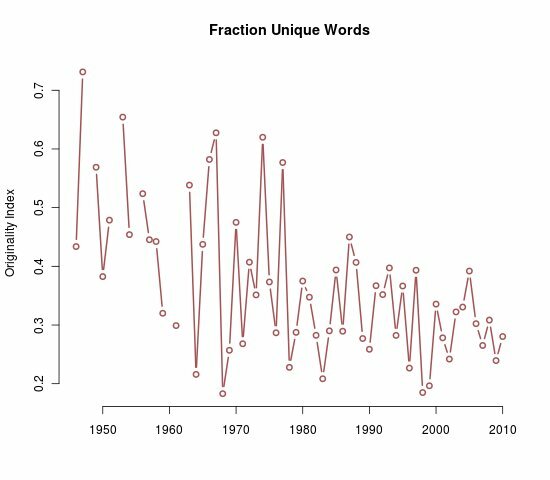 The image below is graphical proof that pop song lyrics are becoming more repetitive over time (I’m not sure if it answers the age old question: Music or Lyrics?) It shows that pop song lyrics contain fewer unique words than they used to. This blog post delves into the details. Songs have become longer over time, since technology no longer limits singles to be ~3 minutes long. It’s not surprising that (a) songs have more lyrics and (b) a small proportion of those extra lyrics are new (if the chorus is sung one or twice more, it would add no new words). Some excellent songs have few words (such as Hey Jude by the Beatles), so I wouldn’t equate fewer unique words to a song being bad. HT to John D. Cook. Fraction of words in pop song lyrics that are unique. Is this graphical proof that songs are getting worse over time? The US Forest Service has been using linear programming models to plan long-range harvesting and tree rotations (FORPLAN, SPECTRUM, Timber RAM). A search on their web site yielded a few OR papers that go back to the 1960s. Forestry models can have sustainability constraints, where sustainability ensures that the harvest rate does not exceed the rate of natural regeneration and that the harvesting costs that do not exceed the rate of financial growth. Mixed integer programs have been used to model a wide range of shorter-range problems, such as balancing harvesting with road building, how to perform weekly harvests, how to match the timber supply with demand, locating harvesting machinery, and truck routing. These forestry models balance efficiency with ecological issues such as biodiversity, wildlife, preservation, soil protection, water quality and scenic beauty. (I’ve never added a “scenic beauty” constraint to a model. It sounds like fun!) Forest managers have to deal with ever more stringent constraints, such as protecting more habitat/protected areas, planning for habitat patches with no grown trees using adjacency problems (areas that are cut cannot be next to one another, leading to checkerboard-like cutting patterns), and requiring corridors of forest to remain to allow wildlife species cover, feeding, and foraging opportunities. Forestry problems have different features than agriculture problems. The forestry problems are often longer-term and the data are often harder to obtain than in agriculture problems. In agriculture, problems are often solved for a current season, where the costs, prices, and yields can be reasonably estimated from past experience. This doesn’t hold for forestry problems, where the sources of uncertainty often stem from future prices, tree growth rates, and disasters. Some agriculture problems are variations to the classical Diet Problem that determines how to cheaply feed farm animals blends of various food stuffs. Of course, this makes sense. I am always surprised when I find out that an idealized OR model that I’ve used in the classroom really makes a difference (see Mike Trick’s post on using the Secretary Problem to find love). My university just launched a social networking site (hosted by Zimride–see a short video here) for students, staff, and faculty to rideshare and carpool. Users can offer a ride by posting time, location information, and price, or they can search for existing rides. Zimride seems to work using Google Maps, databases, social networking practices, and decent search options. Zimride was inspired by Zimbabwe’s low tech ridesharing system, which works well without the aid of google. My university’s Zimride system been operational for about a week, but a quick search already indicates several rides in my neck of the woods. There are not many economic incentives for carpooling in the metro Richmond area, which is why the bus system isn’t as popular as it could it. But I wonder if the wide use of social networking tools combined with a heavy dose of eco-guilt will help it take off. The benefit of Zimride is that it creates a flexible transportation system that can supplement public transportation routes. It can be extremely helpful to those who cannot drive due to disabilities or health problems. I am anxious to see how users create a set of ridesharing paths and hubs where carpoolers can meet up, since users will be indirectly recommending bus stops and routes for a better public transportation system. The routes will reflect seasonal demand more so than a subway or bus system would. My campus is a good candidate for ridesharing tools, since the options with the public bus system are limited. Most bus routes go through the downtown, but most students–and I–are on the uptown campus. Since I need to work around my kids’ schedule, I’m not sure if I will be able to take advantage of Zimride except in am energency, but I am glad to know that getting to campus will be a lot easier if something comes up. On a side note, I tested out Zimride’s commute calendar, which allows users to organize their trips (whether they rideshare, walk, bicycle or drive to work) and then generate a report about miles saved, CO2 saved, and dollars saved. The report has some naive assumptions (e.g., it doesn’t take the miles driven to a rideshare location into account, it assumes a running cost of $0.55 per mile and 25 miles per gallon), but I suppose the report gets you into the ballpark. Accuracy probably is not really the point. The VCU STS initiative sponsored an e-Festival Sustainability Symposium. I had the pleasure of attending Ramana Pidaparti’s talk on recycled materials for sustainable housing applications. Green engineering has never been hotter. And it has a huge impact on energy usage. The US Green Building Council (2001) reports that 37% of total energy consumption in the US is due to housing. Since we spend nearly five times as much on renovation than on new construction, there are many opportunities for making green buildings that save energy, reduce carbon emissions, and reduce waste. His research group minimally processed aluminum cans (i.e., by cutting and pasting) to construct aluminum-wood composite laminate. It reminded me of the weather sensors used in the movie Twister, except this is real. He is hoping to use these designs in a coffee bistro for Monroe Park, a park in the middle of VCU’s campus in need of a facelift. Dr. Pidaparti also mentioned that cost does not capture all important attributes in green constructions, since the consumer does not absorb all costs (such as the implications of waste). It sounds like there may be opportunities for decision analysis to take these other attributes into account. The 18th Annual Future City Competition for middle school children will examine affordable sustainable housing this year. Perhaps the winning competition will use OR? Read GreenOR for more about, well, green OR. Gas cost more than $4 a gallon until recently, which encouraged people to drive less, buy bicycles, sell their SUVs, and consider carpooling. But is carpooling a good option? Sheldon Jacobson and graduate student Doug King tackle this question in a recently published paper in Transportation Research Part D (Transport and Environment), which made a bit of a splash. They show that although carpooling saves gas, it guzzles time. For carpooling to become attractive, we would have to value our time at almost nothing ($4.24 for car drivers and $4.68/hour for light truck drivers). Car pooling makes sense if the carpoolers live close to one another (so they don’t waste a lot of time picking everyone up) and if they can save a lot on tolls and parking. My husband carpools about three days a week, because he otherwise has a long commute (his work offers additional incentives for carpooling). The hardest thing about car pooling for him is the lack of flexibility in work times (he leaves early in the morning to return home at a decent time). If he isn’t driving, he can nap during the long drive to work. So if you’re a napper, car pooling can purchase two naps a day. On a related note, a couple of years ago, Sheldon Jacobson and and I predicted that if lighter people from the early 1960’s drove today’s cars, we would save 938M gallons of gas a year due to the extra weight (both men and women gained an average of ~24 pounds between ~1960 and ~2002). Sheldon Jacobson and grad student Doug King updated this research, since (1) Americans weigh even more now, (2) Americans drive even more now, and (3) Americans have grown taller. Baesd on these factors, we could now save 1.21B gallons of gas per year if people from the early 1960’s drive our cars today (an increase of 21% over my estimate). Although men and women take the same amount of trips per day (4.1), men drive much more than women (37.6 miles/day compared to 21.2 miles/day). This is particularly accentuated for adults aged 25-54 years old, who do the vast majority of the driving. Say what you about how much we drive in this country, but most of the driving is done by adults going to and from work. Unemployment obviously saves a lot of gas, but I can’t exactly see this as an upside to the rising unemployment rate. The extra weight in my car is due to car seats. Nearly every state has rigid car seat laws that require parents to lug around heavy car seats in their cars for years and years. Buying a lightweight car seat could save a lot in gas over its lifetime. One of my car seats is very heavy, and I feel guilty about this, but heavy seats often do well on the safety tests, and I am not willing to trade safety for gas. What heavy items do you carry around in your cars that you can’t do without? Do you carpool, and if so, why? My family is just now recovering after 2+ weeks of battling a nasty virus )-: I missed blogging. I have something interesting to write about today. Yesterday afternoon, I attended a talk by Dr. David Carlson (inventor of the amorphous silicon solar cell in 1974, currently at BP Solar) about the depletion of our fossil fuels, global warming, and solar energy. In the talk, Dr. Carlson guided us through the fossil fuel controversy, and encouraged us to think about photovoltaics and solar power. Although I know little about peak oil, I’ll explain it how Dr. Carlson explained it in his talk, focusing on modeling. Oil discovery has been declining, and even the oil companies forecast declines. After oil is discovered, oil production ramps up, peaks, and then declines as the oil is depleted. Production peaks 25-45 years after discovery. Oil production peaked in the US in the early 1970’s and has been declining in North American (US + Canada + Mexico). Oil production has been leveling off in the Persian Gulf by some estimates. Has worldwide production already peaked? It may have. Based on (1) oil discovery and (2) oil production, many experts predict that the total worldwide oil production will peak between 2010-2020, but there is a lot of variation. Unconventional oils could be widely used soon (decreasing demand for conventional oil), but it is possible that these will make even more carbon dioxide than conventional oil. All peak oil estimates depend on predictions on growth of the world economies. Cheap alternative energy sources could also make a splash, changing oil demand. The bottom line is that predicting peak oil depends on several forecasting models (oil discovery, oil production as a function of discovery, oil demand, world economies growth). Each forecasting model has large error bars, and combining the sources of error doesn’t exactly make the predictions any easier (forecasting is tough!). But we are sure that (1) the planet is getting warmer and (2) we use a lot of oil, (3) our oil won’t last forever, and (4) carbon dioxide hangs around in the atmosphere for decades, so we need to do something now. It bothers me that the talking heads have been talking about peak oil forecasts as if they were certain, because the variance in forecasting estimates are generally very large. Dr. Carlson also talked about how global warming is measured. It isn’t easy. All measurements have large error bars, and thermometers haven’t been around for very long. In addition, although the average global temperature is increasing, it is not increasing everywhere at the same rate. Arctic temperatures have risen much faster than the rest of the planet, resulting in fast melting of the the ice caps. Measuring changes in sea level is also difficult. Using tide gauges is problematic, since you cannot assume that land level is a constant frame of reference over long periods of time. Satellites are currently used to measure temperatures and sea levels. Listen to a podcast about peak oil. Learn about Princeton’s Stabilization Wedges. I am sure that many of you know more about these issues than I do, and I apologize about any errors on my part. Please leave a comment if you want to add something! A few weeks ago, I caught a couple minutes of a Michael Pollan interview (the Omnivore’s Dilemma) on Bill Moyers Journal. It was fascinating, but I was tired, so I turned the TV off and went to bed. I just got around to listening to the podcast. Pollan mentions several issues in the interview that have OR implications. Food security is a big issue when our food system is centralized. It is easy to contaminate our food supply when so much food is processed in one location. This is not a new issue, but may have an OR solution. Lawrence Wein talked about the issue at the INFORMS annual meeting (Wein wrote a paper about botulism in the milk supply). Pollan is very critical of the school lunch program since it is used to get rid of food surpluses, which means that students are fed junk food. This really gets me riled up since my oldest child is almost old enough to start school. Pollan advocates spending $1 per student per day to increase the nutritional value in school lunches. Here’s the kicker. As part of the solution, a certain fraction of this extra $1 should be spent within 100 miles of the school in order to meet many social goals (increasing nutritional value of school, reviving the local economy, supporting local agriculture, reducing our dependence on the amount of fossil fuels to transport food all across the country). This sounds like an optimization problem! Pollan proposes a way to measure how healthy out diets are: the fraction of our meals that we cook ourselves. Discuss amongst yourselves. Looking at the fraction of our diet that comes from plants (as opposed to animals) could also a decent measure or looking at the fraction of our diet that is not made of corn by-products (corn syrup) eaten might be OK. On the other hand, a diet of all Fritos is 100% plant-based so it scores high in my first measure, but it is also 100% corn-based, so it scores low in my second measure. I think Pollan has me beat. I started a garden this year. I built a raised garden bed and planted tomatoes, zucchini, green beans, eggplant, sweet potatoes, hot banana peppers, and butternut squash with various levels of success. It was easy and fun. Digging up sweet potatoes was more fun than I could have imagined (9 small plants yielded about a bushel of sweet potatoes). My cherry tomatoes were so delicious that I ate all of them right off of the plant (a few a day over the course of several weeks). It didn’t generate 40% of my food consumption, but it’s a good start. Watch the Michael Pollan interview here.